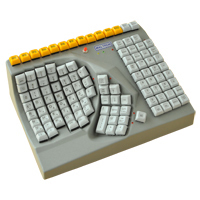 The Mouth-Head Stick Keyboard from Maltron has a unique shape and keyboard layout suitable for those who cannot type with their hands. The shape matches natural head movement and the key arrangement minimises finger or stick activity, raising speed and relieving frustration. This item is a US language keyboard. 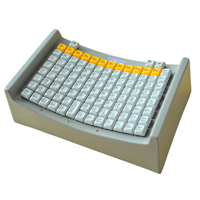 The Single Hand Keyboards from Maltron have been developed as a logical step forward to meet the needs of those who need to perform keyboard operations with one hand. The shape matches natural hand movement and the key arrangement minimises finger movement, raising speed and relieving frustration. 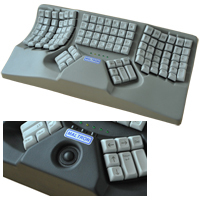 The unique switchable dual layout feature of Maltron keyboards has now been developed for single handed keyboards to give an alternative number entry option. For intensive number work the flat number panel alongside the letters is not ergonomic and can lead to fatigue as there is nowhere to rest the hand during pauses. To overcome this problem the number pad numbers are now also grouped on the letters keys. Either letters or numbers may be immediately selected by pressing a separate button. Windows keys are also included.